And who knows, you just may find brighter horizons and not feel doomed in life! Attribution: girl in a hat walks down a busy city street in the winter via Unsplash. Unfortunately, for me, the English Literature curriculum was more geared for training prospective teachers. I ended up switching to Journalism and Professional Writing, and it was the best decision I made for myself. I am finally working towards a career that actually has different options and directions. No offense to teaching, of course! Deciding whether or not to switch your major is a gamechanger in your career trajectory. It takes a lot of time to process the changes that come with it, and to make sure it’s not a rash decision. Learn from my experience. Here’s how you can tell if switching your major might be a good idea for your own sanity. 1. You’re bored in every single one of your classes. [Image description: A girl bored to death in class VIA GIPHY]. If you’re not into your classes, what’s the point? It should be something you’re willing to invest time in. Personally, that’s how I felt when I was an English Literature major learning about poetry and subjects related to that. 2. You don’t talk about your major to others. [Image description: A girl with flaming red hair puts her head down on the table and the caption reads “I can’t even” via GIPHY]. When you’re passionate about something, there’s a sudden urge to discuss it. The fact that it doesn’t show means that it’s not right for you. Pursue a career that makes you happy you’re up in the morning. 3. You start thinking about other careers and other majors. [Image description: Batman pondering his options via GIPHY]. When you start thinking about different careers and majors mean that you’re not giving your all to the major you’re currently in. It’s hard to think about your current major and the responsibilities that it entails if you’re not passionate about it. Eventually, you’ll just feel like dropping out of college. Before you do that, consider another major if you think that might help you. 4. An Academic Counselor thinks you should change majors. [Image description: Academic counselor from the show Glee via GIPHY]. If you’re unsure about what your next steps will be after you change your major, talk to an academic counselor at your university. It is great to have a third party with an unbiased opinion help you out. You might even consider alternatives that you wouldn’t have thought of yourself. What’s important is that you seek the help you need. 5. Your pro-con list has more cons than pros. In the end, the choice is yours, obviously, but it’s important to make a pros and cons list to help you make your final decision. It will help you get an idea of what you’re expectations are. You will get a good sense of what your intentions are and how you feel about all of this. It’s important to know what you want so that you can work towards achieving your goals. 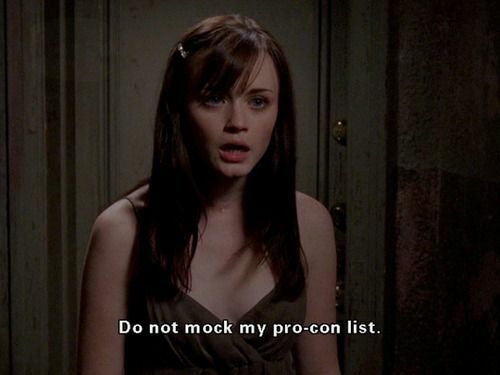 [Image description: Rory GIlmore from “Gilmore Girls” takes her pro-con list very seriously via WordPress]. This isn’t something you should decide in one night. Take some time to contemplate it and figure out what you want to do with your life. It’s going to be difficult to decide if switching your major is ideal for you, but it will be worth it in the end.